The trick to tea-infused shortbreaad isn’t to brew the tea – that would change the consistency too much – what you need to do is finely grind the Black Lavender tea. You can do that by either using a pestle and mortar (as I have) or an electric spice grinder. Another tip for this recipe is to freeze your shortbread so that it’s much easier to cut your cookies into discs! If you want to add some fun to your cookies, mix in a bit of purple food colouring as you blend your wet and dry ingredients together. Of course you can choose any colour, but purple seemed to fit so well with the lavender (and the spring season)! This is the perfect bite-sized cookie to pair with your afternoon tea. The hint of black tea and strong lavender flavour is a pleasant combination. I don’t think I ground my tea enough as the shortbread had a certain grainy texture to it, but I actually found myself liking the graininess. Especially with the white chocolate-coated shortbread. 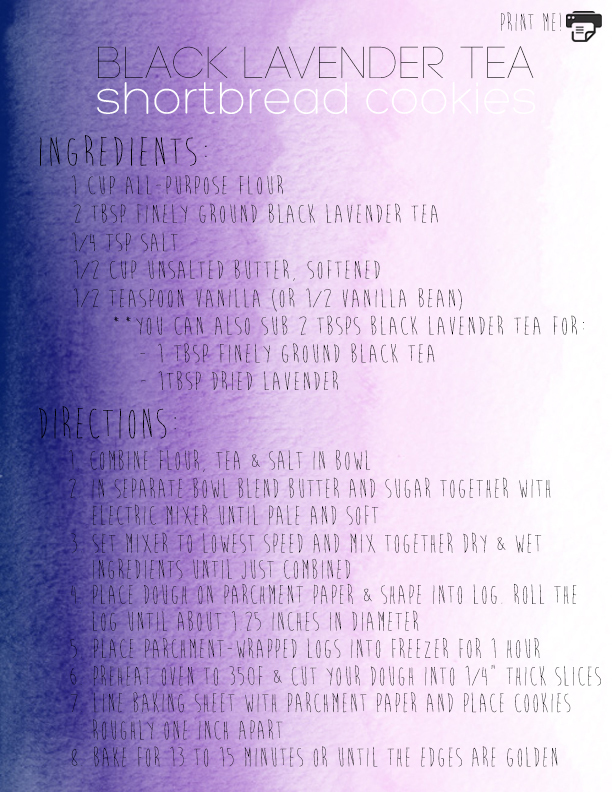 This recipe has been adapted from Stash Tea’s Lavender Earl Grey Shortbread. I think this would actually make the perfect cookie for a Mother’s day gift (for your mother or grandmother!). Especially wrapped in a nice decorative box or baggie. Mother’s day is quickly approaching, do you think you’ll give this recipe a try? !